Clean lines pair with tropical materials for an effortlessly chic chair. 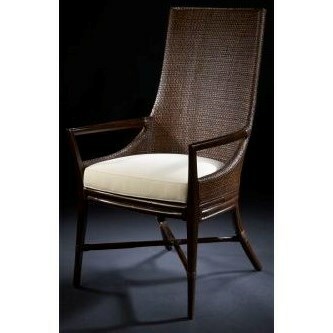 The upholstered seat promises comfort, while the woven rattan back and frame speak to the natural beauty of the tropics. Perfect as an accent chair in your living room, an office chair, or even a dining host chair, this armchair marries sophistication with relaxed island vibes. The Santana I Armchair at C. S. Wo & Sons Hawaii in the Hawaii, Honolulu, Oahu, Hawaiian Islands, Waikiki, Diamond Head, East Honolulu area. Product availability may vary. Contact us for the most current availability on this product.